Luxembourg’s Prime Minister Xavier Bettel joked that Brexit is like Samuel Beckett’s “Waiting for Godot.” Unfortunately, many U.K. citizens in the Grand-Duchy have become the protagonists in a tragicomedy of their own. Since the June 2016 referendum, there’s been an influx of finance workers fleeing the City of London. But other Britons, employed at EU institutions, were essentially forced to seek Luxembourg citizenship just to cling on to their positions -- usually losing generous expatriate allowances that were a big chunk of their pay. Even so, getting dual nationality hasn’t been a career-saver, according to people who asked not to be named because they didn’t want to jeopardize their jobs. 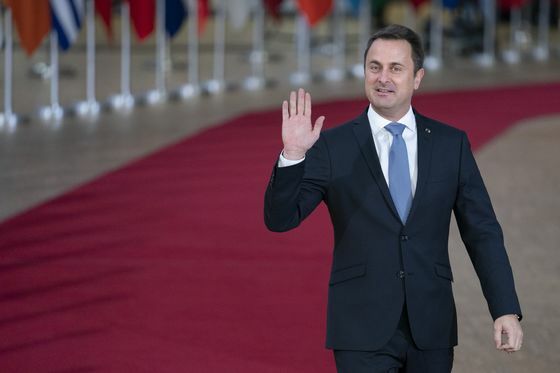 The nagging uncertainty for the more than 6,000 British citizens in Luxembourg pushed the nation’s government into legislating to protect them against a no-deal Brexit. That possibility has become very real since U.K. Prime Minister Theresa May suffered multiple defeats to get her EU withdrawal agreement passed in Parliament. Like Brussels, Luxembourg is home to many EU institutions, including the EU’s two top courts, the European Investment Bank, the Court of Auditors and parts of the European Commission and the European Parliament. Brexit would bring with it the loss of a key condition for most of the staff working there getting in at all: being an EU citizen. Those in the top jobs are the most likely to be dumped if and when Brexit happens. They include the U.K.’s two EU court judges. Hundreds of others are EU staff with short-term, renewable contracts. People concerned say the only option to keep such a job or have their contract renewed beyond the Brexit cut-off date has been to take on the Luxembourg citizenship. It’s a process many began as soon as the referendum result was announced, to make sure they wouldn’t end up unemployed. Getting Luxembourg citizenship is now feasible for those who have lived in the country for at least five years. The number of British citizens taking on dual nationality has more than quadrupled since 2015 to 435 people last year, according to Luxembourg government statistics. Days after the Brexit vote, European Commission President Jean-Claude Juncker sought to reassure Brits in his institution. Similar soothing words have since been uttered in meetings with commission staff, and also with EU court workers in Luxembourg. But further clarity has been lacking as U.K. lawmakers flip-flopped over their country’s departure. The European Parliament has a total of 407 staff with U.K. nationality, of whom 59 are based in Luxembourg. The EU courts, consisting of the EU Court of Justice and the General Court, have 64 British nationals working there, including both U.K. judges and one advocate general. The European Commission has almost 80 British staff in the country. The European Court of Auditors has 43 U.K. nationals among a total of 900 staff. The EIB didn’t respond to emails. The employment conditions for those working in EU institutions are set out in the bloc’s staff regulations. They offer few assurances though when it comes to an unprecedented situation like Brexit. The rules say that EU officials “may be required to resign” if they no longer fulfill the conditions, such as being a national of an EU country, “unless an exception is authorized by the appointing authority.” The official response from EU institutions is that they will look at each person based on a case-by-case basis. For workers on short-term or non-permanent contracts in the EU courts, their situation will be evaluated on a case-by-case basis, according to Juan-Carlos Gonzalez, head of their press service. All contracts “have, so far, been renewed and staff have been informed that we expect this to be generally the case,” he said. Still, the spirit of “solicitude and generosity toward U.K. members of staff” promised in light of Brexit hasn’t been able to soothe all of those directly affected, according to Godfrey. Neither have a series of no-deal preventive measures by Luxembourg to help British nationals keep their right to stay. Unlike Estragon and Vladimir who decide to leave at the end Beckett’s play, most Brits in Luxembourg have decided to stay in their adopted country.